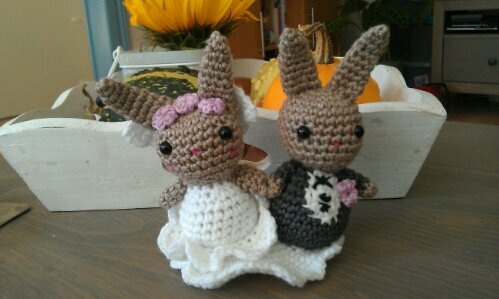 My cousin is getting married today and I almost forgot to crochet him and his fiancee a little gift! Luckily, Google always has the answer when it comes to quick little projects and I found a really cute pattern on Lion Brand. They look adorable together, don’t they? I’ve got a bit of a headcold, so I’m pretty much rambling today. I have built a little crochet cave on the couch with a blanket and food and all my supplies together and I’ve been watching Graham Norton all morning. Around the beginning of this blog, I’d worked on Fluttershy and Rainbow Dash from the series My Little Pony: Friendship is Magic. Back then, I’d already mentioned that I might make the rest of the set, The Mane Four (which is not a typo) when I’d run out of projects. And this time has come. Well, I didn’t exactly run out, but I didn’t know what to work on next. I should be able to finish her up this weekend and then it’s just Applejack and Twilight Sparkle to work on. I’m going through them a bit quicker than the last time I worked on the ponies, but then again, being familiar with the pattern goes a long way. Also, I don’t have to make wings for them, so there are a few less parts to work on. The basic pony pattern is from HookedOnAnime as before, but the manes I’m working out myself. I’ll post a quick how-to when I’ve finished all four, in case anyone is interested. One of my friends -the lovely Jaqueline over at EenMooiMomentje– has been going through a pretty rough time. There are plenty of things that can cheer me up and at the top of that list is crafting with friends, drinking tea and eating sushi. So that is exactly what I invited her over for a few days ago. We had a great day, me working on my latest project and her knitting away at a warm hat for the coming winter. Our cat Wisky was especially interested in her knitting needles (something she’d never seen before in her life), while our other cat Japie thought of them more as something he desperately needed to murder as soon as possible. Despite all the distractions, Jaqueline still got a bit of work done. I’m not regularly afraid of bugs in general. Frankly, whenever I come across one I don’t feel like catching and releasing myself, I set one of our cats on it. That usually clears up the problem in no time, especially since one of them loves to eat bugs. It’s like we don’t feed her anything, whenever she can get her claws on one, she will eat it. Sometimes she runs around the house with a huge blowfly still buzzing in her mouth, trying to find a quiet place to enjoy her snack. But I degress. It was our second to last day in Greece and I had just gotten out of the shower when I noticed something underneath the fridge. So I bent down to look at what had caught my attention and I saw that it was a rather large, black bug. Since we didn’t have the cats with us on this trip, I decided to call out for Boyfriend so that he could swoop in and save this damsell in distress, yours truly. Now, if there is one thing I have learned from this experience, it’s that I should never, ever again call for Boyfriend when there is a large bug to be taken care of. He ended up being more grossed out by it than I was. Eventually, since the bug didn’t seem to want to come out from under the fridge and we couldn’t clearly make out what it was, we decided to leave it in peace. Problem solved, you would think. Everytime we came close to the kitchenette, we could see it scuttling back under the comfort and safety of the small fridge, so I figured it was more scared of us than we were of it and everything would be just fine. Boyfriend didn’t feel quite the same. He really wanted to know what it was, but, since we hadn’t seen more than just it’s huge antennea, we could do nothing more than speculate. He eventually decided that it just HAD to be a cockroach. I had my doubts, figured it would much more likely be one of the crickets you could hear all day, but couldn’t see. But as I said, we hadn’t seen the whole thing yet, so I couldn’t debunk Boyfriends idea. We didn’t see the thing for the rest of the day. 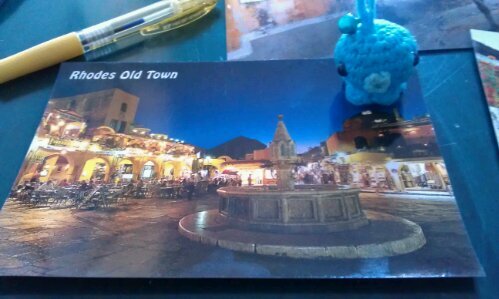 That night, I was exhausted as usual (waking up every morning at 6.15 and not getting any sleep until the evening, plus doing loads of touristy stuff will do that to me) so I went to sleep early. Boyfriend was still up, but in bed next to me, playing on his Nintendo DS. Right when I was falling asleep, he suddenly cried out and jumped onto my side of the bed, scaring me wide awake in an instant. He’d heard something next to him and when he looked on his nightstand, The Bug was right there! According to Boyfriend, it flew at him when he saw it and then mysteriously disappeared, either behind his pillow or somewhere else in the room. The bug-hunt began, me looking all over and Boyfriend asking me if I’d seen it from the other side of the room. (Okay, maybe I’m making this worse than it really was. He could’ve just gone to the bathroom while I was trying to find The Bug, but humour me ^_~) I couldn’t find it anywhere, so I got ready to go back to sleep. But Boyfriend had another idea. We needed to switch sides, since The Bug might be behind his side of the bed. Also, he wanted to know what he should do when he saw it again. So I went into the kitchenette, got one of the cooking pans and told him that if he saw it again, he should put the pan over it and we would see what we’d do with it in the morning. As long as he’d let me sleep, it would be fine. No more incidents through the night and the next morning we both woke up refreshed. Boyfriend was still wondering what The Bug might be, since he saw it flying across the room. He figured it couldn’t be a cockroach, since it flew. Unfortunately, I watch too much Discovery Channel and spend too much time on the Internet, so I was able to tell him that yes, cockroaches can in fact fly. They don’t seem to do it a lot, but still. During the day, he kept thinking about that creepy Bug crawling all over our appartment while we were enjoying our last day next to the swimming pool. I tried to comfort him, but I guess I’m a little too sadistic to really get him to feel better. Around late afternoon, I started to fall asleep over my book, so I decided to go back to our room to get a little nap in. Boyfriend went with me so I wouldn’t be alone. And of course, right as I was falling asleep, Boyfriend suddenly started slamming the drawers of his nightstand, scaring me awake once more. When I asked him what was wrong, he told me The Bug was in his nightstand. He was looking for his DS Adapter, but instead, found the huge, black bug in there. It was time to take action. As soon as he’d told me that The Bug was moving slowly in there when he’d opened the drawer, I figured it couldn’t be a cockroach, they’d be running like crazy if you suddenly exposed them to light like that. I told him to get a bowl or a glass or something, put it over The Bug and we’d put it outside. He did just that. A cricket, just like I thought. We set the little guy free on the grass behind our room and at least I could sleep well the last night. You might be wondering where I’m going with this extremely long and slightly senseless story. He’s found the catfood! Now we’ll never get rid of him.. Oh well, welcome to your new home, Carl! 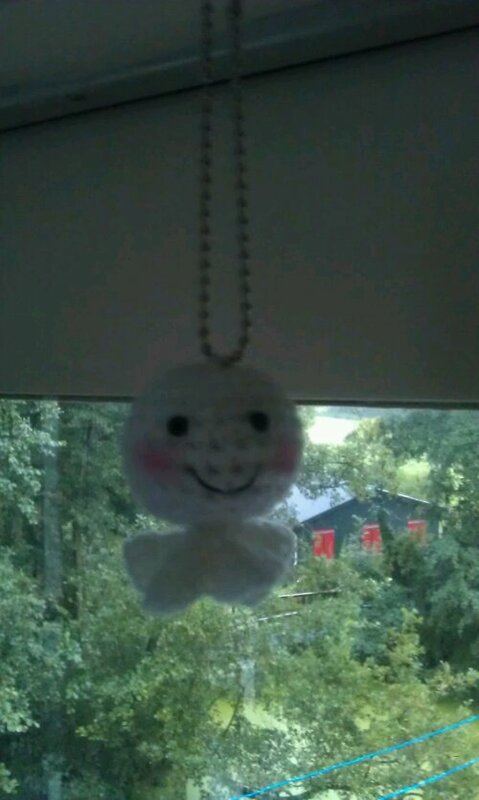 So to get back into the swing of things, I made a ‘Teru Teru Bozu’, a little charm to call for good weather. 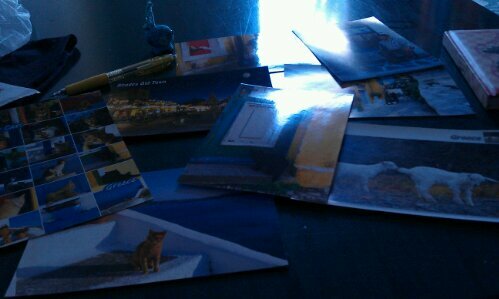 I hope it will work, but if it doesn’t, I’ll just have to fill this rainy day with loads of crochet!